Exploding computers have been a staple of science fiction movies since at least the 1950s. Computers exploded on Star Trek in the 1960s, on Star Trek in the 1980s, and on Star Trek in 2009. War Games, a 1983 film, had an exploding IBM 1401, built in the 1950s. James Bond films frequently have exploding computers. For years I made fun of this, since computers are not explosive. They are made of metal and plastic; there are no combustible or fissionable components. The may short out, smoke, and possibly even catch on fire (briefly, as few pieces burn all that well), but they don’t blow up. I was preoccupied with something else and wasn’t paying that much attention until she pointed to the warped aluminum plate. Grabbing a quarter (just the right size for the screw head on the battery cover), I removed the battery and, without question, it had exploded. My spouse couldn’t recall any kind of noise; she’d been using it all day, had put it down for a few minutes, and when she picked it up, she noticed it was “off.” And that it caught on her skirt. Removing the battery and plugging it into power, we quickly discovered the computer was fine, as was her data. Only the battery was dead, and it was very, very, very dead. We marched off to the Apple Store in Columbia, where one of the employees tried to tell us “this happens all the time” and that you know a battery needs to be replaced when it explodes. I rather forcefully suggested he was full of it, and accepted a no-cost replacement battery. It worked perfectly, and the computer is back in service as if nothing happened. An exploded battery, removed from a MacBook Pro 17" laptop computer. 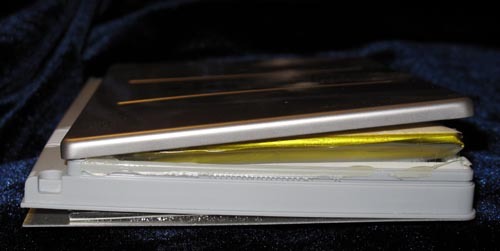 Note how the bottom plate of the battery -- which is also part of the bottom surface of the computer -- is warped outward. But something did happen: a consumer device – a non-explosive consumer device – exploded. This is not a normal event, and it is not how a Sony-manufactured lithium battery should normally expire. So we went to the U.S. Consumer Product Safety Commission Web site, and filled out a complaint. Even if you love Apple products, please don’t be fooled into loving exploding computers. Leave that to Hollywood. If your computer battery explodes, complain. And ask Apple for a free replacement.